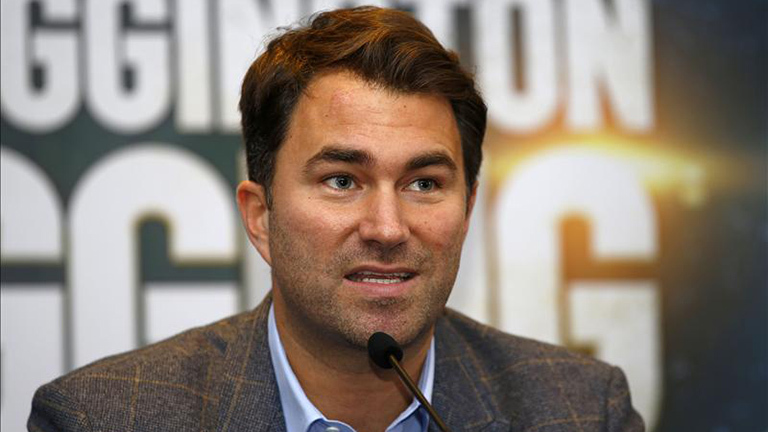 Eddie Hearn has lashed out at Deontay Wilder 40-0 (39) as the mooted heavyweight unification clash between the American and Great Britain’s Anthony Joshua 22-0 (21) looks further away than ever. The British promoter delivered a scathing assessment of Wilder’s market value in an interview with iFL TV after the ‘Bronze Bomber’ claimed he would be entitled to a 60/40 purse split to fight ‘AJ’ after he defeats lineal heavyweight champion Tyson Fury in December. The Matchroom Boxing boss went on question the undefeated 32-year-old’s popularity and marketability in the crowded sports market. “A row of beans over here, you could walk up any high street, any town, any town in the world and ask who Deontay Wilder is and no one has a f***ing clue who he is,” continued Hearn. “He ain’t even going to do 300 [thousand] pay-per-views on Showtime [against Fury] and you want 60/40? Idiot. Don’t waste out time. Don’t use Joshua’s name to gain profile and publicity. F***ing waste of time. Earlier this year the Wilder and Joshua camps engaged in very public negotiations for s fight that seemed doomed to failure from the start. Discussions broke down in July with both sides issuing recriminations at the other. Joshua, 29, went on to defend his WBA, WBO and IBF titles against Russian veteran Alexander Povetkin in September, winning by TKO7. Wilder has signed on to defend his WBC title against Tyson Fury at Los Angeles’ Staples Center on December 1.